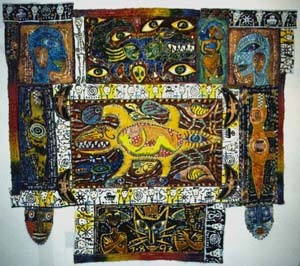 Healing Quilts Gallery. Turtle Moon Studios. Susan Shie. There are a lot of large, complex quilts which I designed and made, and Jimmy contributed to, that we made in the 1980s to early 2000s, and this is the start of a gallery in which to show them to you, focusing on them in this category of healing. They are, of course, still within the whole body of our work as diary quilts. I'm beginning with Tattle Tails: Crocodiles for Alzheimer's, because many people have asked about it, as it's about my experiences with my mother having AD. So here is Tattle Tails, and I'll eventually add more. Had to dust off my slide scanner to get this one, but it was pretty easy and good practice, so I plan to do more. (Many of these quilts are in my pre-digital archives.) Enjoy. Tattle Tails: Crocodiles for Alzheimer's. Read the statement and view larger image and large detail of this quilt which helped us work through the stress and celebrate the love of taking care of my parents during Mom's Alzheimer's years. Web site design © Susan Shie and Jan Cabral 1997. All subsequent web site work, ©Susan Shie 1997-2007. This page updated by Susan Shie, August 25, 2007. Web site hosting by Key to the Web, Ltd. ©2007.